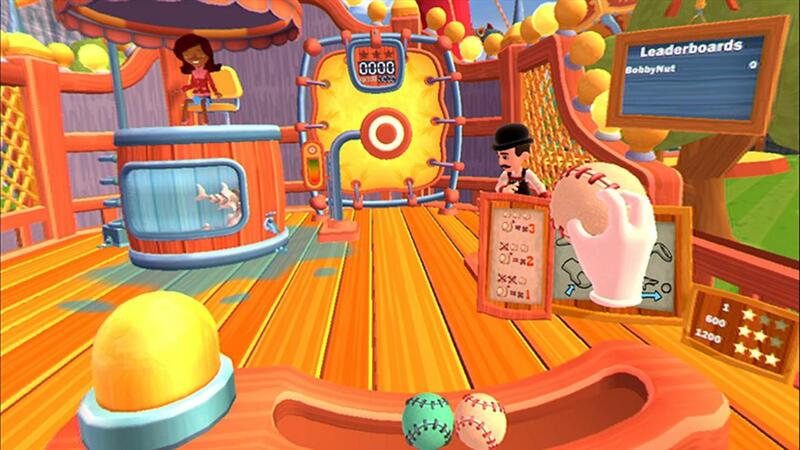 Carnival Games was a nice little casual game that took advantage of the motion controls on the Wii. It wasn’t anything spectacular, but my son had a lot of fun with it. 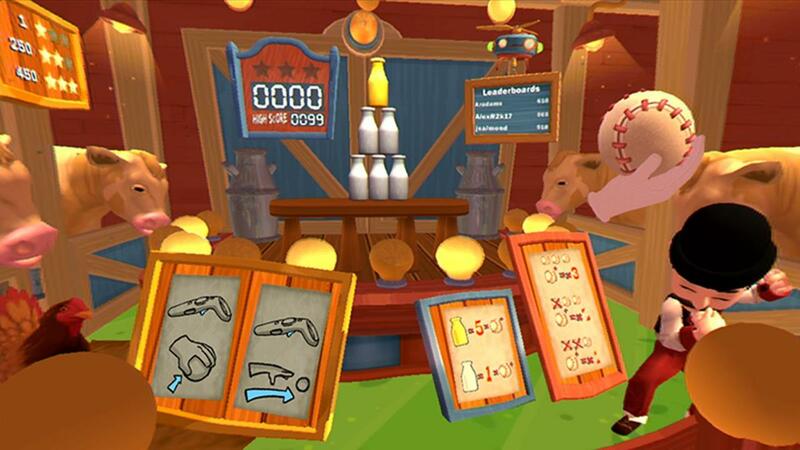 A new Carnival Games is coming out today and with the advent of VR, it’s taken the the series to another level. 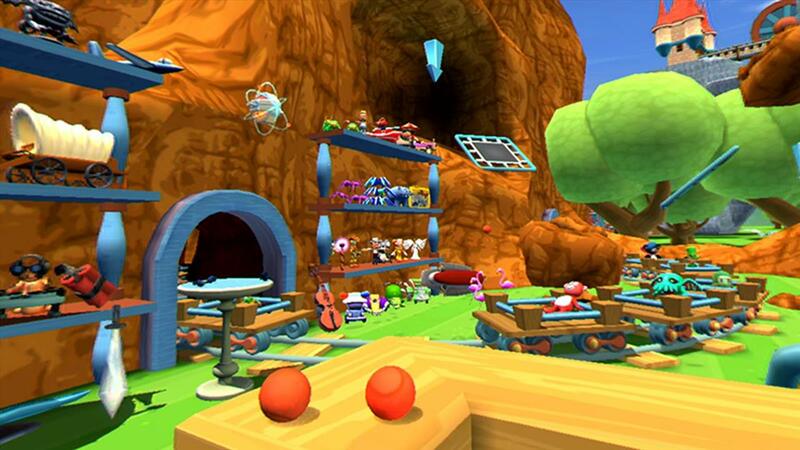 The game’s style is very similar to the Wii version, but a raft of refinements and improvements in graphics. Compared to say NVIDIA’s FunHouse VR, its graphics and physics are way less intricate and detailed than video card company’s tech demo. It’s not a game that’s going to wow you graphically, but the style works well for a casual game. Kids will enjoy the crazy character designs and cartoonish world. You’re represented by two hands that will be used to interact with the world and the games. Pushing both thumbpad buttons will re-center your view, which is convenient. Other than the trigger, which will be the action button, there’s no other buttons needed to play the game. 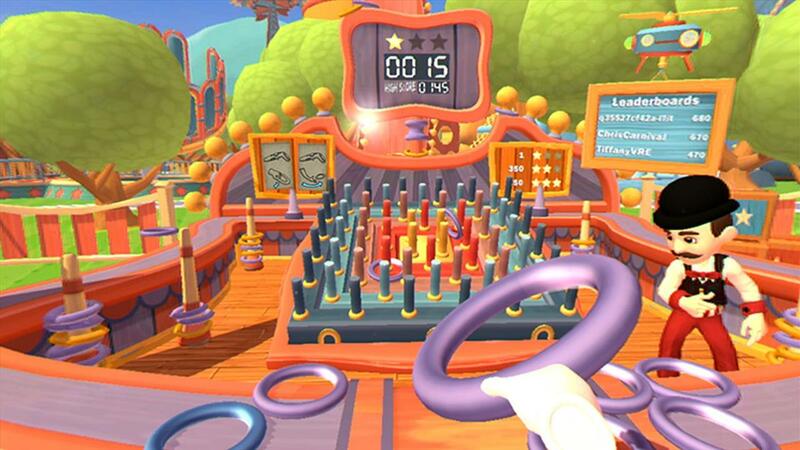 The controls for Carnival Games VR makes it easy to get into for all ages since it’s so simplistic. I think that prototype glove from Valve would actually work really well with something like this so maybe if someone does come out with a controller that’s glove like, it would make playing Carnival Games VR more engrossing. Being inside the carnival ups the immersion factor immensely. Looking around and being in the middle of it all really improves the experience a great deal over the Wii game. Seeing various park visitors walk around or play next to you adds a little more to the game than just seeing the activity you are playing on a flat screen. There’s no teleportation mechanic so you can’t go anywhere in the game. Walking around is very limited making Carnival Games VR more of a stationary experience. You go from station to station by using your hands to “grab” a game or location. The games are situated in four different themes. You’ll start out with the cowboy theme area, and will have to win tickets to unlock the others. Thankfully, it doesn’t take too many tickets to unlock an area. Each area will also have a single carnival game locked until you win enough tickets from the other games. Again, it doesn’t take too long to do so. You’ll have to win tickets in that specific area to unlock one the remaining carnival game. That means you can’t game the system and say play really quick rounds of skee-ball and try to go over to another part of the park and unlock that game or prizes. Some folks might not like being forced to participate in one of the games specific to the part to earn the prizes, but I can see why this decision was made. Taking advantage of the motion controls for the Vive, Carnival Games VR seems to have a better feel than when it was on the Wii. The twelve games available are all unique and offer up a different experience. My favorites include the skee-ball, shooting gallery, dunk tank, and baseball bottle toss. 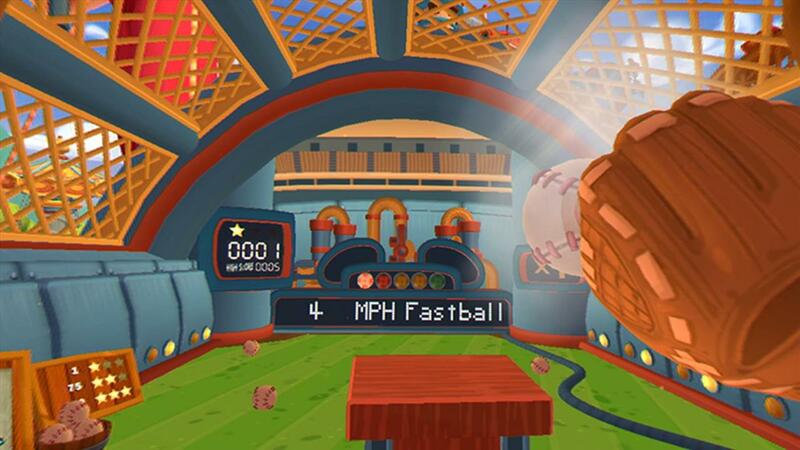 The skee-ball implementation is one of the better ones and I didn’t get frustrated when throwing like I would in say Pool Nation VR. Being able to just hold down the trigger and have the ball float to your hand without having to reach for it makes it easy to get into. You can get a nice workout in the climbing game. Here you grab onto ropes, chains, rock climbing holds, and so on and drag the world around you to move around. Reach out, grab, and pull towards you to move. The climbing course is pretty long and I worked up a nice sweat traversing the course with my arms. It reminds me of one of the play modes for Hot Dogs, Horseshoes, and Hand Grenades, minus the shooting, of course. The haunted house attraction might make people a little sick though. You’re sitting in a car that travels through a house on a track where you use two guns to shoot at targets to earn points. The motion is slow, but it did take me a moment or two to get adjusted it. Those who aren’t VR veterans and are prone to motion sickness should probably stay clear of this one. If you can take it, it’s not a bad little mini-game and one I do go back and play a few times. All games have a star rating based on the scores you get. The more stars you get, the more tickets you earn. Tickets can be use to unlock one of the locked carnival games in each area and win prizes. You can then take the prizes and play with them in a play area. There’s a toy track with cars on them that you can put your prizes on to. Or, throw some of them on trampolines and see them bounce around. There’s even a little trophy case area where you can position your prizes in the air and make scenes from them. Carnival Games VR has a leaderboard, but only the top 3 scores show up. At least, I couldn’t figure out if you could find more names on there. It does give you a small goal to shoot for, but I would’ve liked to have seen some way to filter that scoreboard so maybe you’d just list the scores from your friends. The replayability will depend on how much you like casual games. It will probably take you an hour or two to unlock all the areas and games, but there are plenty of prizes to win. The game will most likely appeal to kids more than adult, so if you do have little ones, I think this is a very good VR game for them to play. It’s not complicated to control and the visuals are very kid friendly. For the more seasoned gamer, there’s probably not enough to keep you all that interested after a few rounds on each game. At $20, it’s not a bad price for a casual VR games if you have someone who loves carnival games or have children that want to play. It’s nice to see the series jump from the Wii to VR and it does improve on that game with the immersion factor. Great for kids, but might not be enough there for older VR gamers.